It comes with a Label Cloud. 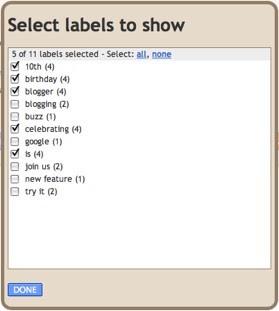 It lets you choose which labels are to be displayed. You can customize it further using CSS. The cloud just has 5 variations.All labels will be divided into 5 classes depending on the usage of these labels. It would have been better if there was a bigger number of classes. You can customize the looks further by using CSS..As i said it has 5 classes of clouds..You can add CSS styles to each of them. Here is a sample Style which will give a bluish look for the cloud..Here i have applied styles for all 5 label classes and their hover styles (so 10 style definitions in total). Here all of these CSS styles are customizable.You can change the colours and font sizes of each of the 5 classes. Wow! blogger is getting better day by day.But i prefer the other cloud which has more options.I hope that blogger will improve this gadget with more variations. Although it's nice to see Blogger finally implementing this functionality, i think they are way too late. 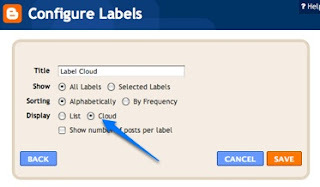 Whoever wanted it in their blogs already have Label Cloud Widget installed and configured, so why bother switching now? I don't want the links to be underlined. How can I change that? I've been looking forward to this style. Thanks for sharing. Can I install this if I have a custom template? My template is all HTML. i have blogger blog, but do admire the clouds od wordpress. they r just awesome. blogger got some work to do. why is it that flash clouds can´t work on blogger blog? I've got the same problem as Abhishek. I choose which labels I want to show and save it, but then it shows all of them anyway. I've tried this many times with more than one of my blogs and it just ignores the options I select. Any insight on this? First of all thanks for all the ideas and tips. My question is if it's true that the labels at Blogger won't be considered for SEO? If yes, how can it be changed? this is such a great site..the simplicity and dealing of various topics is very nice..happy new year and great going..!! i will apply this method on my blog www.healthisdivine.blogspot.com. Thanks for good tutorial on label cloud widget. how to get the labels like you ?